Now that I am not so sleep deprived I can brag about my new puppy. He is, of course, a black and white Border Collie. Now that I am not so sleep deprived I can brag about my new puppy. He is, of course, a black and white Border Collie. His dad is German/International Champion, “Kendo”, and his mom, named “Fa”, is a point or so shy of her championship. 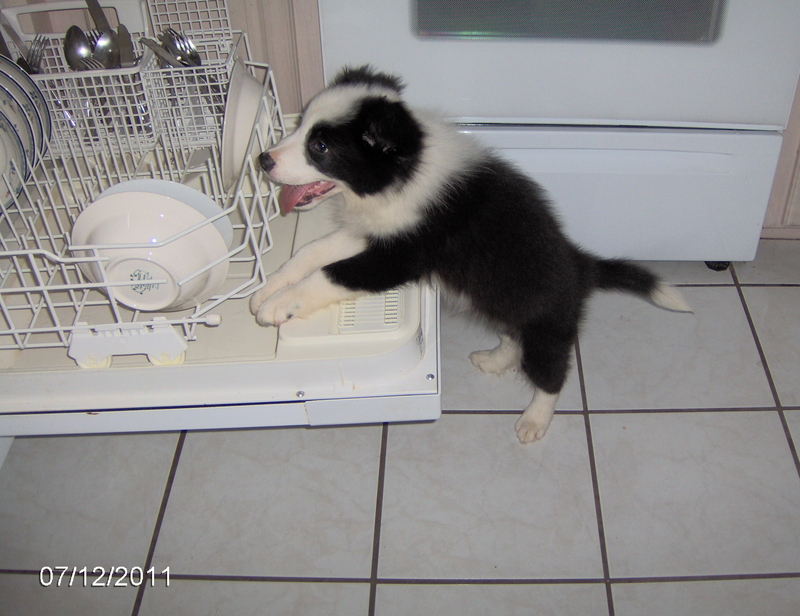 The breeder is Renea Windley of Companion Border Collies in Molino, Florida. The male puppy’s name is “Catcher” and his registered name is Companion’s Panda-monium. The pictures included here are some of the few I took in his first weeks at home. At this weekend’s show in Pensacola, Florida, Michael Loftis, www.loftisphoto.com, took a few pictures showing Catcher’s stunning face. My puppy has one blue eye and one brown eye, which is a constant reminder of a beloved blue merle Sheltie I had in Oregon. Catcher is just under four months of age. I am lucky to have Leading Edge Obedience trainer Joanne Permowicz nearby who is teaching me how to introduce Utility and Open exercises, as well as basic obedience to the puppy beginning from eight weeks of age. Catcher’s vocabularly so far includes: close, place, stand, get it, out, front, here, twist, spin, quiet, oops, stop it, chewie (bone), tuggie (toy), bunny (soft toy), woobie (big soft toy), kennel (crate), water, suppertime, potty, poopy, stick, pinecone, let’s go, drop, and back He has been introduced to spoon heeling, go backs, releasing objects from his mouth gently, a puppy recall, marking objects I’ve thrown, and Utility signals. This little mind is a sponge eagerly asking for new experiences and adventures. It is my responsibility to make sure he is safe, well fed, and mentally stimulated. 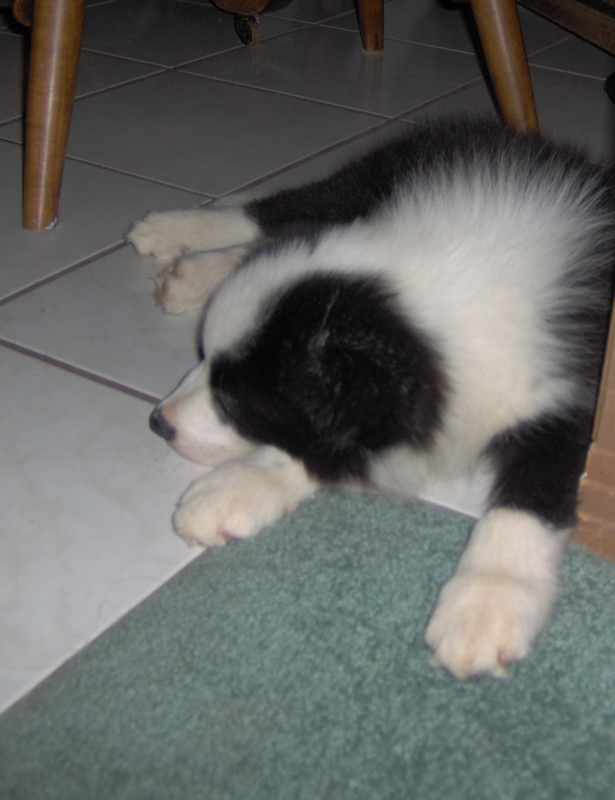 I am lucky to have two adult Border Collies that he can emulate, although he is not allowed to run loose with them yet. Much of Catcher’s daily life is patterned after Bobbie Anderson’s book Building Blocks for Performance. She stresses the importance of having a good relationship with your dog at home so that the dog respects and obeys the handler in whatever performance event that is chosen later on. Therefore Catcher has to learn to sit before eating and wait until released, not whine or bark in his crate unless he has to potty, to have a soft mouth, come when called and leave certain things alone, to name a few behaviors. It is my responsibility to make myself the center of his universe using play and structure. The book is excellent and I highly recommend reading it BEFORE you get your next puppy. At night Catcher sleeps in his crate surrounded by the two loose adult dogs. Therefore he soon learned to sleep through the night and to potty outside immediately. Dogs love a structured environment so I try to do the same things every day, as much as possible. He loves to ride in the car. I will have to teach him to wait before jumping into the crate since he is fed in the car crate in the morning and it is a very positive location for him. No puppy is perfect or at least none I’ve ever owned. Catcher has discovered how far toilet paper can unravel and that my house has two toilets so twice the fun. Essie the cat is not afraid of dogs but prefers not to be goosed by a puppy so she quickly popped Catcher on the nose a time or two to teach him to respect her space. But her kitty box is very enticing so that is where the “leave it” command will need a great deal of training since the behavior is self rewarding. Ick! Catcher likes to bite and found fingers and toes were so much fun since they constantly moved. A couple of lessons and he is getting the message that is not a behavior I enjoy. Its not like he doesn’t have tons of bones and toys to chew on. He is the first Border Collie I’ve owned who is slow to wake up. He doesn’t come bounding out of his crate but stretches, lies down, rolls, tries to chew on my fingers and slowly decides to take on the day. Fortunately puppies nap a lot. Unfortunately that nap time decreases as they get older so I have to preplan my chores around his sleeping schedule. I love my new dog and have high hopes for him in the breed ring, tracking, Rally and Obedience. He’s not over the top nuts but has a nice attitude and good energy. I’ll post more pictures when available as well as training stories. This entry was posted in border collies, Dog training and tagged Border Collie. Bookmark the permalink. Catcher is beautiful. Its seems ages since Ziggy was so small. Bless him he’s now 9 months and pretty much fully grown. They grow so fast. On one hand I love the puppy stage but it is nice living with older dogs too.